Woods Island is a remote Vermont State Park situated in the northern part of Lake Champlain near St. Albans, Vt. The island is a mile long and a quarter mile wide. There is no ferry service. With only five campsites, this 125 acre park, with 2 miles of shoreline allowed me to have all the privacy I could ever want. ( if I was willing to work for it ). There is something appealing to me about camping primitively on an island. The work involved is often rewarded by good views and the ability to detach from the riggers of life. There is a sense of peace and freedom knowing that there is nobody around. In 2008 I bought a 18 foot aluminum canoe from a friend of a friend. It is a dinosaur! I wanted to find things that my kids and I could do together. The kids and I made several reconnaissance missions to Woods before planning our camping trip on July 4th weekend 2009. 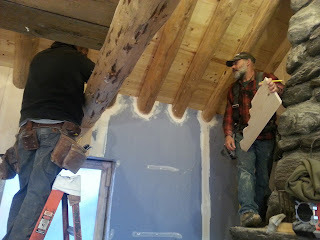 Near the top of Mount Mansfield, reconstruction of the historic Stone Hut is nearing completion. Barring any last minute construction issues, the Hut will be open to overnight guests again starting December 1, 2016. The hut was closed to visitors after a fire on Christmas Eve, 2015, destroyed most of the building. 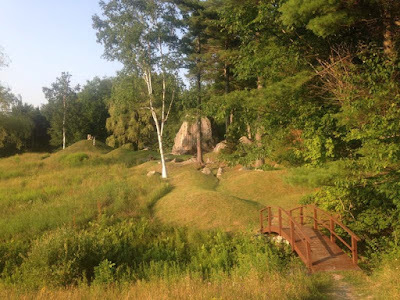 Through the efforts of the Department of Forests, Parks & Recreation (FPR), and funding received through Vermont Parks Forever, the non-profit foundation supporting the parks, rebuilding the Stone Hut was fast-tracked so that visitors would be able to return this season. 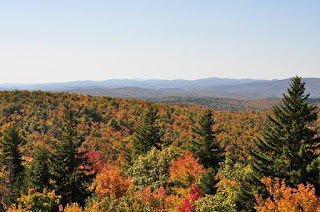 Today, the Carson Davidson Revocable Trust Fund entrusted 204 acres of beloved property in Hubbardton to the Vermont Department of Forests, Parks, and Recreation as part of what will be Vermont’s newest state park. The Taconic Mountains Ramble park was the vision of Carson “Kit Davidson, who passed away this past Thursday at the age of 92. Long before he built a Japanese garden in the shadow of Hubbardton’s Mt. Zion, documentary filmmaker and author Carson “Kit” Davidson lived with his wife Mickie, a children’s book author, in the heart of Greenwich Village. Both he and Mickie loved the downtown’s creative energy, but they wanted a summer escape north of the city. The couple had a specific vision for their land, one not easily fulfilled until a fortuitous trip to Vermont in November of 1966 after five years of searching. 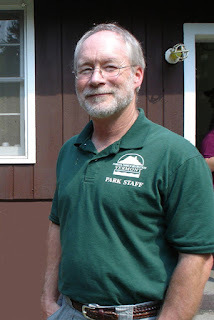 Craig Whipple, Director of Vermont State Parks, will be presented with the prestigious national “Legends” award by the American Academy for Park & Recreation Administration at an awards ceremony this week. The Legends award is presented to distinguished leaders who have made outstanding contributions to the field of parks and recreation. Video interviews are conducted with each recipient, exploring their personal background, professional insights and philosophical beliefs and are made available to educate and inspire others working in parks and recreation administration. Only a few recipients are awarded each year, and Craig is only the third Vermonter ever to receive the award, joining Theresa Brungardt, Vermont’s first Director of Recreation, and Edward Koenemann, former State Park Director.